When will be Feud: Bette and Joan next episode air date? Is Feud: Bette and Joan renewed or cancelled? Where to countdown Feud: Bette and Joan air dates? Is Feud: Bette and Joan worth watching? Feud: Bette and Joan is based on the legendary rivalry between Bette Davis and Joan Crawford which began early on their careers,climaxed on the set of "Whatever Happened to Baby Jane?" and evolved into an Oscar vendetta. With production on the film underway, Bette and Joan form an alliance, but outside forces conspire against them. As the film production reaches its climax, the feud becomes physical; Bette's relationship with her daughter becomes strained when she bonds with a new cast member; Joan reveals an intimate detail about her past. Bad word-of-mouth plagues "What Ever Happened to Baby Jane?'' on the eve of its release; Bette and Joan brace for failure; Pauline tries to break gender barriers; Oscar nominations are announced. Bette is on track to win a record-breaking, third "Best Actress'' Oscar; Joan and Hedda launch a clandestine campaign against Bette. 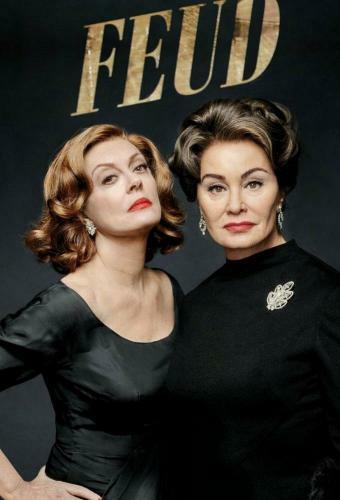 Feud: Bette and Joan next episode air date provides TVMaze for you. EpisoDate.com is your TV show guide to Countdown Feud: Bette and Joan Episode Air Dates and to stay in touch with Feud: Bette and Joan next episode Air Date and your others favorite TV Shows. Add the shows you like to a "Watchlist" and let the site take it from there.